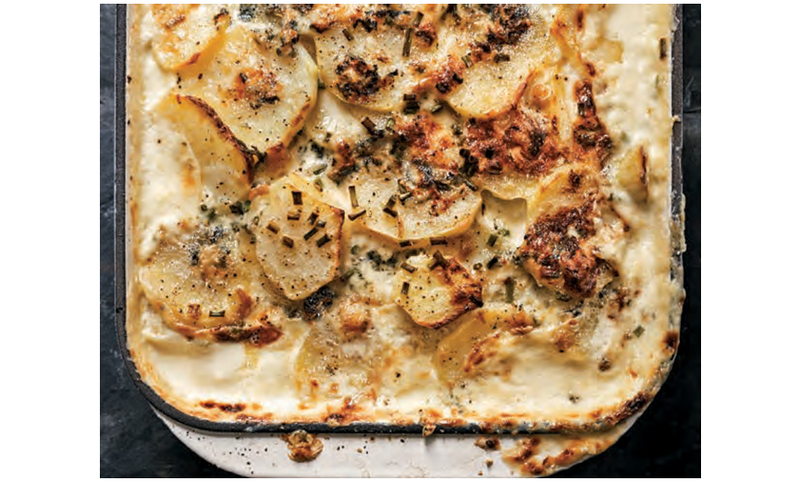 Although I’ve confessed to never being comfortable with the term comfort food, I’ll admit it’s a pretty spot-on moniker for potato gratin. Pouring cream over a dish of potatoes and adding some blue cheese and garlic, mellowed and sweetened by oven roasting, elevates a common tuber into a dish you want to snuggle up to, spooning up the long-cooked potatoes with pock- ets of oozing cheese between them, and not stopping until you’ve scraped the browned, caramelized bits off the sides of the baking dish. Whew! Come to think of it, now I’m feeling all comfy and drowsy myself. When assembling this bliss-inducing dish, I like to keep the cheese in fairly large chunks so it doesn’t get lost among all the potato slices. As for the potatoes, a buttery-flavored potato, such as Yukon Gold, works well here. Russet potatoes are good candidates for layering in a gratin, too. Cream is traditionally used, which reduces in the oven to a rich, buttery nappage, but half-and-half can take its place if you’re not comfortable with all that cream. Serve with caillettes (page 185) or with a green salad, as lunch. Preheat the oven to 375F (180C). Trim the hard stem ends off the garlic cloves and put them, unpeeled, onto a piece of aluminum foil that’s large enough to envelop them. Drizzle in a small amount of olive oil, close it securely, and roast in the oven for 45 minutes, until the cloves are lightly caramelized. (You can do this a few days ahead when you are using the oven for something else, which is what I usually do.) Leave the oven on and adjust the oven rack to the top third of the oven. Remove the garlic from the skins and mash the cloves in a saucepan with a few spoonfuls of the cream to make a paste. Put the saucepan over low heat and add the remaining cream; heat until warmed through and then set aside. Peel and slice the potatoes into 1/4-inch-thick (.75cm) slices. Generously butter a 2 1/2-quart (2.5l) baking dish with sides at least 2 inches (5cm) high. Put one-third of the potato slices in the baking dish; season with salt and pepper. Sprinkle one-third of the chives over the potatoes followed by one-third of the blue cheese. Add another one-third of the potatoes, season with salt and pepper, and sprinkle with one-third of the chives and blue cheese. Add the final layer of potatoes, then pour the cream mixture over them and press down gently to flatten the potatoes. Season with salt and pepper, and sprinkle on the remaining chives and blue cheese. Put the gratin dish on an aluminum foil–lined baking sheet and bake for 1 hour, until it’s bubbling and well browned on top. The acidic cheese may cause the cream to separate a little bit, which is normal. 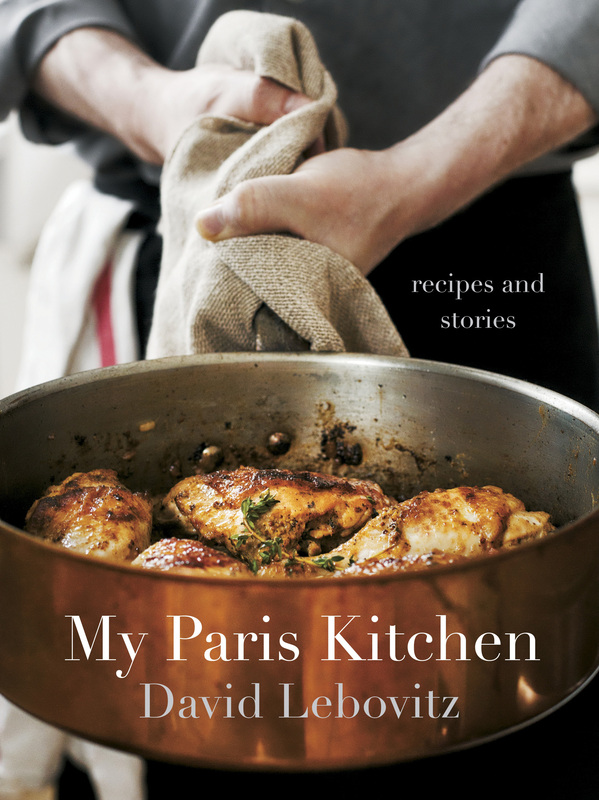 From David Lebovitz’s new book My Paris Kitchen. Order your copy here. Reprinted with permission from My Paris Kitchen by David Lebovitz, copyright © 2014. Published by Ten Speed Press, a division of Random House, Inc.